Yelp Charlotte is throwing their biggest party to date in Uptown and is opening it up to all Yelpers! Entry, food, beverages and entertainment for this event are completely FREE with your RSVP. Get on the guest list by filling out your Yelp profile and following the RSVP instructions. This party is guest list only and attendance for this event is limited, so RSVP early! 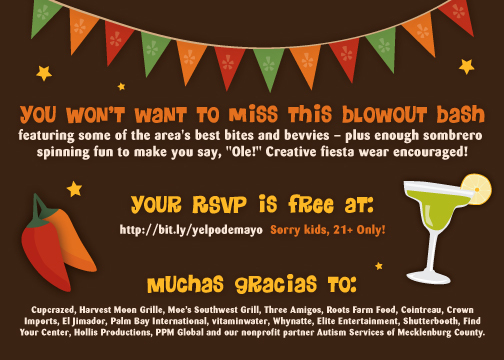 You won’t want to miss this blowout bash featuring some of the area’s best bites and bevvies — plus enough sombrero spinning fun to make you say, “Ole!” Creative fiesta wear encouraged! This event will benefit Autism Services of Mecklenburg County. So come out and eat, drink and have fun while helping out ASMC.